How to pick the best preserving methods for you summer harvest for a year’s worth of food, or if not a year’s worth of food, how to preserve it to keep it from going bad before you and your family can eat it. 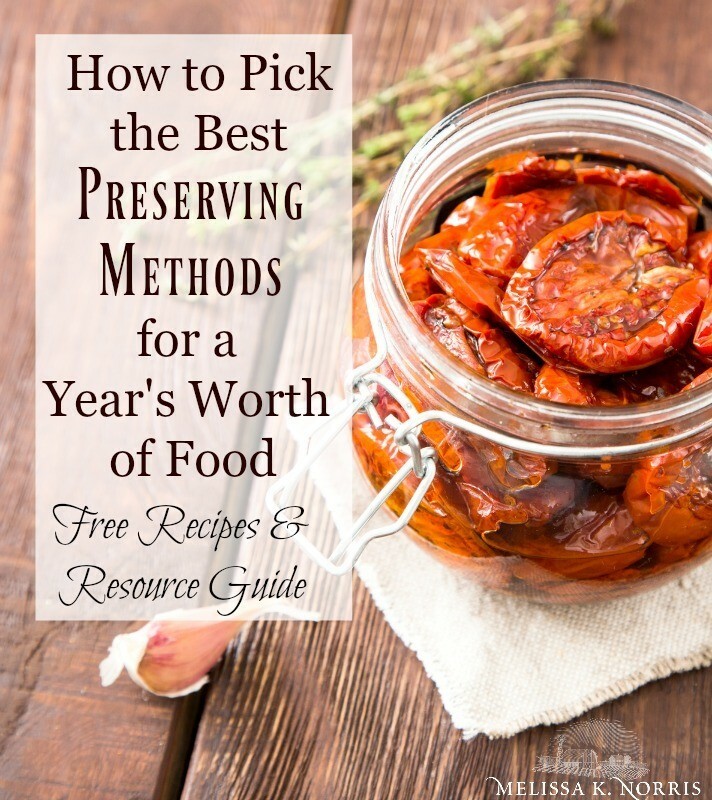 I invited back Carolyn Thomas of HomesteadingFamily.com to discuss how we go about choosing which method is best for which crops, why we choose one method over another, and our favorite recipes for each of the main home food preservation methods, including recipes! I have readers and listeners of the show email me or leave a comment and say, “I really need some inspiration on ways to prepare all of this wonderful food that we’ve preserved, but how do I go about really turning that into meals and making sure we’re using that food to feed our families?” The answers below! Listen below to, How to the Best Preserving Methods for a Year’s Worth of Food #149 of the Pioneering Today Podcast, where we teach families how to grow, preserve and cook their own food using old-fashioned skill sets and wisdom to create a natural self-sufficient home, with, or without, the homestead. Click Here for Your FREE Resource & Recipe file from today’s post! You know we do, we love canning in our house. We do a lot of it, and some of the things that we really like about it, is that for one, it usually turns out a familiar product. It's what we're used to using. We have this cultural familiarity with our canned food, which makes it a lot easier for people to consume. You don't need to develop new tastes in order to enjoy your canned food. So, I really like that. And another thing that I really see as a huge benefit for canned food is that, you can make meals that are just ready to eat. You heat them and you go. And that is really amazingly simple when you need some convenience food on hand, to have those just sitting on the shelf and ready to go. Melissa: I think canning is really the ultimate batching when it comes to doing meal prep, because and the same thing and then when we're really busy out, or in the middle of winter of course those foods aren't available from my garden or locally, but I can go and pull out two or three jars, sometimes four depending on what it is I'm making, and all I have to do is pop it open, mix it together, and heat. And you know, supper can be on the table in 10 or 15 minutes. So that is definitely a pro. With the other forms, especially when it comes to dehydration, you need extra liquid. With canning I don't have to worry about having extra liquid to make anything, because I'm not having to rehydrate it or really add, and usually, especially if it's soups or stews or something I'll always have canned up bone broth, so I can add that if I do need extra liquid. I prefer to pressure can. I think pressure canning is faster, and maybe because the majority of the canning that I'm doing in the summertime with fresh produce, like green beans. I do the raw pack method, so I just pick the beans, rinse them, string them, snap them, throw them in the jars. Put my boiling water on top, and put them in the pressure canner. I feel like it's a lot faster than waiting for that full water bath. Carolyn: Time investment upfront-Well I think that for canning, one of the biggest one that hits me is the time it takes up front. Especially if you're doing pressure canning, by the time you get something into the jars, and then get that pressure canner up to pressure, can it for the full amount of time and then let it cool back down, you really have quite a bit of time investment that happens right up front. And that's one of the big drawbacks. Heating up the kitchen, but there's ways to work around that. I can outside, almost year around, to try to keep the heat out of the kitchen space. But it definitely, if you don't have a spot to can outside, it adds a lot of heat to the house if you have big batches to do. Equipment investment. The canner, the pressure canner, and then all the jars and the lids. You really have to use those standardized pieces of equipment there, and for some people, that's really prohibitive, that initial investment in getting set up to can. So those are kind of the big cons for me on the canning side. Carolyn: When we can peaches in the water bath canner, everybody just loves those. And I think, who doesn't love peaches any time of the year, but then in the middle of winter, when you can open a canned peach and it just smells like summer, oh that is such a wonderful thing. And then you can make up quick cobblers, you can do so many great things, or just eat it plain, so we really like that one. And I think for me, one of the things that I like the most pressure canned is meat of any sort. And again, that's just because you're doing all of your work up front. It's like, in the summertime, in the fall, when you're doing all that pressure canning, you're actually just preparing your meals. You're just doing it in one big batch all ahead of time. When you can open up a jar of meat that you have pressure canned and be ready to dump that and make a stew or a sandwich filling, or anything like that, I love that. I think to me that's really adding to the convenience of my life, as well as having all those great stored foods. When you have meat on the shelf, you really feel like you're prepared for anything. You know, anything can happen and I'm good to go. Melissa: When it comes to the fruit, I have to say one of our favorites is strawberry jam, for sandwiches or having it on biscuits, and then I even like to take jam, I'll do it with fruit butter, kind of any the fruit preserves and use it as a filling between cakes. Especially chocolate, because strawberry and chocolate, cherry and chocolate, raspberry and chocolate, they just go so good together, and then it's a really quick one. And for me, I think with pressure canning, I do definitely love to have meat, but I also, probably home canned tomato sauce. Just because it's so versatile, so I'll can up the tomato sauce and then turn that into pizza sauce, pasta sauce, add it to chili, or soup, or stew, for an extra flavor or thickening. I pressure can my tomato sauce, it's just so fast, and like I said, I can put way more in my pressure canner and I just kind of prefer to use that one than a big boiling pot of water. So, I'm gonna go with tomato sauce on that one. Do you have some kinds of pros and cons when you're choosing this method for preserving the food? Carolyn: I definitely do, because there are very specific foods that we tend to dehydrate. And so a lot of times when I'm trying to decide, what I'm gonna do with each bit of produce that's coming in, I want to think ahead to what I want to use it for. And to make sure I have all of my uses covered, so I don't find myself running to the grocery store because I didn't think of something that I wanted to use tomatoes for, or fruit for, or something like that. We find is if you take something that is so filled with moisture that it's heavy and it's bulky, and you dehydrate out a majority of that moisture to leave it very light and very small. Which means packable in my family. If you want trail food, you want travel snacks, you want anything that's light and easy to keep with you, and that really becomes where dehydrating shines in our family. They become shelf stable so they're easy to keep a little snack in your purse, in your diaper bag, on the go, they're really easy to grab and go. Storage-But it also is really easy to store because of that. So when you have your pantry shelf, and I know a lot of us don't have huge pantries, or huge root cellars, or different places to store large amounts of food, but we still want a good amount of food storage, and that's another place that dehydrating really shines. You can get a lot of dehydrated food into a very small space, that rehydrates up pretty bulky. Melissa: Fast prep work. I feel like the prep work up front to get food into the dehydrator is a really fast compared to the prep that goes in towards canning. You are limited to the size of the trays that you have for your dehydrator. And there's many options where you can buy extra trays or get a larger dehydrator. Time factor on the back end. The actual processing time for dehydrating is longer than the canning time. Cherries are probably one of the ones that take the longest to dehydrate, so that can be a con if you've got 30 pounds of cherries, you're not going to be able to dehydrate all of them, because you're gonna have to be letting that first round go, and then bring in the rest. Greens aren't really something that you're going to be able to preserve via canning. I mean spinach, and kale, and lettuce, and all of those items, those are not canning or fermenting candidates. I can take some of those foods that I don't really have another way of preserving them, and then I'm able to preserve them to use them throughout the year. I think that's probably my biggest pro when it comes to dehydrating. Carolyn: We make green powder, our own super green powder out of them, and it takes these bulky, big, giant, big, bulky greens that would just take baskets and baskets in the kitchen, and it shrinks them down to almost nothing once you get them powdered. It just makes storage so much easier. Melissa: I love to dehydrate my herbs, because I use herbs in cooking, I use herbs sometimes medicinally, depending on whether ... and it really does give you that storage capability. When it's in that powdered form, depending on what the herb is, you get that intensified flavor, so think about garlic powder and onion powder, you can take just a small amount, and it brings so much flavor to a dish. Melissa: And one of our favorite things to dehydrate is my kids love kale chips. And I really like kale chips, and it's a great snack food, and a lot of times I'll do them in the oven but right now it's really hot out, and so I can do so much more bulk. I can dehydrate out the whole bunch, and then just have that snack food available for them, too. When you kind of said that prior, snacking and portability wise, it's so great with your dehydrating. Carolyn: When I asked my kids this morning what their favorite dehydrator stuff was, they had a whole list of them one of them is this great little snack we make where we just slice up bananas, and we dip them in slightly melted peanut butter, and then roll them in coconut powder, and then dehydrate those. You can get rid of the candy store. The kids don't even miss it, when you do something like that. It is so healthy and it is so delicious, and just makes this nice chewy, salty, sweet snack. That was right up there on their top but the fruit roll-ups were too. We love those. Any extra fruit, any fruit that's just barely past prime, that we don't wanna can or do anything else with, we just blend those right up and turn those into the fruit leathers. Those make for a great snack anytime. I think for me the sun dried tomatoes, and of course, they're not really sun dried because I do them in the dehydrator and not in the sun, but I like to season them with just a little bit of salt and Italian seasoning before I dehydrate them. I have found that when I'm making pizzas in the winter, a little bit of olive oil brushed on and just a layer of those spread out, and we don't even miss the pizza sauce. So I can do away completely with the canned pizza sauce if I just have a really good supply of these dehydrated tomatoes on hand. So sometimes it's useful to kind of think outside of the box, and say, "Now what can I use this for?" But then you have those guys on hand for pastas, for anything else that you wanna throw some dehydrated tomato slices into. It's really good, it's really handy to have. Carolyn: the number one thing is how much time do you have right then. Because like we were saying, a lot of times, canning something you put a lot of work up front. And sometimes you have that time up front, that you say, "Hey, I can take a day and can this." But other times you say, "I just, I don't have that time. I need to spend a few minutes now, get it into a dehydrator, and be able to leave it alone all day." And so, like you were saying with the time, that's where that dehydration can be really useful. So, I'll look at that, and say, "Do I have an overabundance, can I get that into the dehydrator?" Click Here for Your FREE Resource & Recipe file from today's post!, if that's even a word. Some things rehydrate really well, and you can put them in a soup and nobody even knows that they were ever dehydrated. Some things, they're just never really gonna come back to their same texture, and so trying to think some of those things through. Carolyn: the top of my list for dehydrating is gonna be your sweet corn in the summer. Dehydrated sweet corn, it's like taking a bite to me of sweet corn in the summertime, if you've dehydrated it well. So I love dehydrating the sweet corn. The tomatoes I've already said. Mushrooms. Up in Idaho where we're at, we have a lot of Morel mushrooms, if you can go hunt them at the right time of year. And so, when you find a big stash, boy we just dehydrate all we can, because those come back just beautifully, once they're rehydrated. Whether they're in a stew or a pasta, or whatever they're in. They are just absolutely delicious. Another one that is really high on my list, is peppers. Bell peppers and hot peppers. And those dehydrate so nicely, and they come back with such a wonderful flavor. That is becoming my go to method for the peppers, is just dehydrating them. Melissa: Safety on preserving mushrooms- when it comes to mushrooms, wild mushrooms are actually not safe candidates for canning. You will find tested and approved processing times and methods for doing commercially farmed mushrooms that you can buy at the grocery store, but those wild foragables, we do Morels, too. Morels are my absolute favorite. I love Chanterelle and Lion's Man. But dehydrating or freezing them are really the only two methods that are approved and are gonna make sure that you're safe. And a lot of times with the wild ones, there's just not been the testing that's been done to know what is a safe time for them, and because the wild mushrooms, they all have different textures and sizes so you can't take the tested time for the regular white button mushrooms in that and convert it over and think that it's gonna still be safe. So, I love that you said, yeah, dehydrating is a really good way to go with those. Melissa: I love to have dried dill weed on hand of course, for when I'm doing pickling things when the dill in the garden isn't on yet so I don't have it fresh, because you can use that dehydrated dill for your pickling recipes and your fermenting. But I love to add just little bit of dried dill to my popcorn. We make popcorn probably three or four nights a week here, it's one of our favorite snacks. And I love adding just a little bit of dried dill with a little bit of garlic powder and salt, butter, of course, and brewer's nutritional yeast. There's something about that dill, just a little bit that makes that pop. Carolyn: I think fermenting is kind of this almost the new lost art that we're rediscovering. You know you've heard of sauerkraut forever. That's something that's just carried through, but we're experimenting more and more with the different flavors in fermenting, and what I've gotta say is, there's very few things that don't taste great when they're fermented. One criteria I use to decide is, "How much time do I have?" Because fermenting to me is the fastest of all the preservation methods. I can take a whole basket of tomatoes and I can have those preserved by fermenting them in three minutes, two minutes? It depends on how fast I can stick them into a jar and cover them up with water and salt. It's so fast, that when you get overwhelmed, it is the go to method, and I really, really like that. So I think again, I look at the time that I have. How much time do I have today, to deal with the produce that I have in front of me to get through? And sometimes, during the season you go, you know I have the whole day, and so I'm gonna fill the dehydrator, I'm gonna fill all my fermenting vessels, and then I'm gonna start canning, because I have so many tomatoes, or so much of this or that. But a lot of times you're busy doing life, and you just don't have the kind of time input that it would take. And so that's once of those moments when I really turn to fermenting, is if I just need to get it done right now in the next 10 minutes and be able to walk away. And again, so many things taste good when they ferment, but there are some cons to fermenting too. The flavor does change, and if you want to use fermentation as a long term preservation method, not just fermenting to get the probiotic health benefits, but to really use it to preserve your foods for winter, you really need a place where you can put it, that it's gonna stay cool. It doesn't have to be the refrigerator, that's not necessary, but it does need to stay cooler than our average summer household room temperatures. It needs to be in the low 50 degrees to really stall out that fermenting, so that it doesn't just keep getting more, and more, and more soured, to the point where you don't want to eat it. Melissa: That's the biggest con for me, is just having that cool storage space in order to do it bulk, like preserving a year's worth of food. Because that's kind of our goal, with most of our things, is to be able to grow enough and preserve enough of the harvest is there to take us through until the next growing season, without buying it from the store. I'm limited cool storage space. How do the fermented tomatoes taste? Carolyn: Well this is the first year that I have done fermented tomatoes, and so I wanted to ... always looking for new things to ferment, because I just love how simple it is, and how healthy it turns out. So about two months ago, I went and found the local hot house tomatoes, all I could get, about two months ago. I went ahead and fermented these guys up, just in a basic brine, but I decided to just leave them on my counter that whole two months, because I wanted to see how they would age long term. And we ate those guys the other day, and I think they instantly went to the family favorite fermented food. They were so flavorful and so delicious, and I've gotta say, the acidity already present in the tomatoes just kind of swallows up the fermenting acidity. You didn't even notice the acidity extra. So it didn't taste pickled, it didn't taste really sour. I mean it had a nice pleasant tomatoey acidity, but the strong flavors was just this intensified tomato flavor, like fresh tomato. Think not canned tomato, but like peak of the summer fresh tomato flavor. And all I did is I fished those guys out of my fermenting brine, I stuck them in a blender with a little bit of wild garlic, and a little bit of raw basil, and I blended them up and I poured them over warm noodles. And then we tried it again later over warm rice with veggies and sausage, and the flavor was outstanding. It was so delicious and such a great thing. But again, what I love about it the most is, it probably took me less than 30 seconds per quart jar to preserve those things, and then they were ready to go. And then the cooking on the other side, because I wanted to consume them raw, to really save all those good enzymes and probiotics, the cooking consisted of fishing them out of the jar and sticking them in the blender, and turning it on, and pouring it over whatever I was eating. It was so good that way. Just absolutely delicious. Melissa: You did not move them, so for two months you didn't move them into cool storage. You just left them on your counter? Carolyn: That's right, and right now we are in the middle of a heat spell, and so that counter was getting warm. And if you understand the basics of fermentation, putting them in cool storage just slows fermentation way down. It almost completely stops it if you get it to your mid 30s, right above freezing. And so, leaving them out on the counter is just allowing them to continue fermenting, and continue fermenting. Looking at what something tastes like that's been on the counter for about two months, is kind of equivalent to what something would taste like after it'd been in the refrigerator for maybe six months, or eight months, so you really get a good feeling for it. But that also let's you know that you can keep those things on the counter and just consume them sooner than you would if you were trying to ferment them all the way until winter. Melissa: I like to ferment zucchini with garlic and dill, and make a zucchini pickle out of it, because zucchini, you can safely do zucchini relish, zucchini pickles, that type of thing, acidified wise, water bath canning. But the new recommendation and new testing is that you should not pressure can summer squash. Now you can do winter squash cubed in a pressure canner, but have removed doing summer squash, zucchini, pattypan yellow, all the summer varieties from pressure canning, due to the consistency in the pressure canner getting too mushy, and if it's too mushy or it becomes too thick like a puree, even in a pressure canner, the heat can't get all the way through and kill those botulism spores. So that's just why in older canning books, you would see times and recipes for pressure canning your summer squash. It's no longer a recommendation. And I say all of that, one just so for everybody to know those updated things that safety wise, but secondly, I look at it and I know that zucchini, well I'm only gonna do so much pickled relish that's a zucchini, and of course I dehydrate zucchini, I expiralize it and use the zucchini as noodles, I'll dehydrate zucchini and that does pretty well. Then I'll shred and freeze a little bit of zucchini to use in baking and that, but I love to use the zucchini to do a fermented garlic dill pickle because it doesn't get very mushy. Carolyn: Yeah, and sometimes those flavors develop even deeper as they sit in that cool storage like that. And we often talk about how to keep your cucumbers crisp and pickles when we're canning them, right? When we're canning cucumber pickles. But it's good to know that a lot of those same tips apply for zucchini that are fermented into pickles, and really anything you're pickling by fermentation. And some of those tips are gonna be of course, you it as fresh as possible, but include some sort of tannin in it, so a lot of people will use a grape leaf or a black tea bag, or something to bring some tannins into them. And you can do that right with your fermented pickles as well to help keep them a little extra crisp, and have that crunch to them. So when you pull them out of the fridge and they're cold, you get that good kind of fresh crunch, and that is so good. Melissa: We have a grape arbor and we grow grapes for table eating, and then of course preserving and all that fun. And the grape leaves work really well, but yeah, the black tea is a great way to go to. And yeah, it's funny because when I first started to get into fermenting, because I grew up with canning but I didn't grow up with fermenting, and I was really pleased and kind of, I'm like, "Oh, I didn't know that would carry over," so that was kind of cool. Thanks for sharing that tip, too. Melissa: We have two in our family, and the first fermented thing, and my husband actually does it. He does it as soon as he runs out, he starts a new batch, and that's kimchi. So he loves to make a spicy kimchi, and that's something we pretty much always have going in our house, and that's definitely his favorite. But for me, mine is definitely a fermented cucumber garlic dill pickle. The flavor and the crunch, I mean my daughter and I, we will go through the jars almost as fast as they come ready, and we just adore them. Carolyn: Yep, you know when I was asking my family this morning, they hands down said that the fermented carrot sticks are their favorite, and everyone of them said that they love fermented carrot sticks better than just raw carrot sticks. I cannot get those things into any long term storage, because the kids get their watches going, and the timers going, to when I will let them eat them, as soon as they hit a jar to ferment, because they love them so much. And that's just a great flavor, it just adds a nice little garlicky saltiness to the carrots. I've gotta say that one of my absolute favorites is anything that has been shredded, and shredded and fermented in that way. But my personal favorite is anything that has been shredded and then fermented, like a sauerkraut or a shredded garlic beet. Sometimes I do ginger and orange in shredded beets, and I absolutely love that. You can take that ferment and dump it, even the juice that comes off of it, over some rice and you have an instant lunch. It is so delicious, it flavors everything and it's a quick, healthy delicious lunch that everybody loves because it's got so much flavor. So, that's probably as far as a utilitarian, one of my absolute favorites because it's just ready to go. Click Here for Your FREE Resource & Recipe file from today's post!